You are gathered in a room with a facilitator and sticky notes are flying. You hope that after the session, you’ll be able to tackle your problem to solve with new ideas. 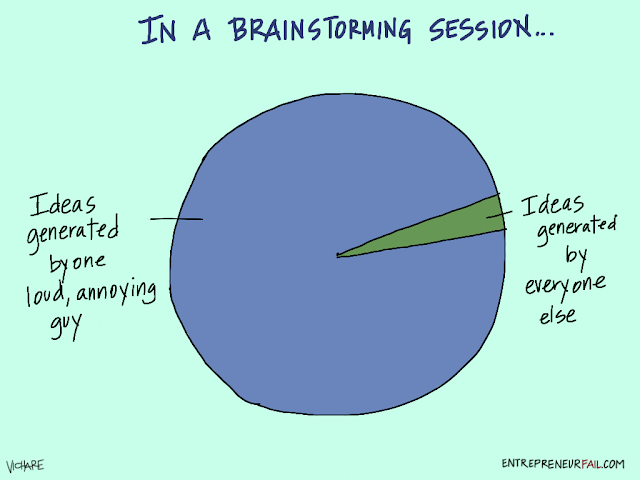 The main goal in a brainstorming (also known as ideation) session, is to generate as many ideas as possible, before filtering them to find an final solution. The challenge however, is that there is always THAT ONE PERSON who dominates the session. If the facilitator is not aware, the extrovert of the room will soon takeover. Include exercises where the attendees can brainstorm by themselves and jot down ideas, in order to share the one good idea.